Quite possibly the longest running talent competition in country music, this year marks the 29th anniversary of the Country Showdown. Welcoming Texaco as it's brand new corporate sponsor, the 2011 Texaco Country Showdown shows promise to be their biggest and best ever and that's saying something. Long before American Idol, Star Search, Nashville Star, etc., this talent contest has spotlighted so many musicians I just had to give them their due and spotlight in this months Musicians Spotlight column. For 29 years this great contest has given tens of thousands of country singers, songwriters, and musicians the chance of being discovered and the opportunity to strut their stuff in Music City in addition to the chance of winning the grand prize of $100,000 if they can make it through to winning at the finals. 450 radio stations across the country participated this year, promoting and hosting their local, state, and regional competitions, starting in the spring. The way it works is, first you have to win your local contest, then your state contest, and then your regional competition to make it to Nashville and the national finals. All state winners receive a cash prize of $1,000 and advance to compete at 1 of the 5 regional contests which are held in the Southwest, Southeast, Midwest, Northeast, and the West. Dean Unkefer is the President of Special Promotions, Inc., and his Nashville based company has been promoting this competition since it's inception in 1982 when Wrangler was it's first national sponsor. His experienced and talented staff do a wonderful job putting on this nation wide competition, year after year, coordinating and promoting over 500 shows all over the US. Past contestants of the Country Showdown who've went on to successful careers in country music include: Brad Paisley, Carrie Underwood, Billy Ray Cyrus, Tim McGraw, Martina McBride, Tracy Lawrence, Miranda Lambert, John Michael Montgomery, Garth Brooks, Mark Chestnut, Tracy Byrd, Jason Aldean, Ashton Shepard, Billy Dean, Sara Evans, and Sweethearts of the Rodeo. Some of the artists who have hosted and performed at the national finals include: Willie Nelson, Loretta Lynne, Kenny Rogers, Tanya Tucker, Kris Kristofferson, Charley Pride, George Jones, Lee Greenwood, Tammy Wynette, Reba McEntire, Montgomery Gentry, Chrystal Gale, Barbara Mandrell, Sara Evans, and for her fifth consecutive year, Curb Records recording artist, LeAnn Rimes. On January 13th, the 2010 finals took place at the Ryman Auditorium with LeAnn as host entertainer and The Nashville Hit Man, Charlie McCoy, as band leader for the 29th year, leading a great 8 piece band composed of some of Nashville's finest musicians. 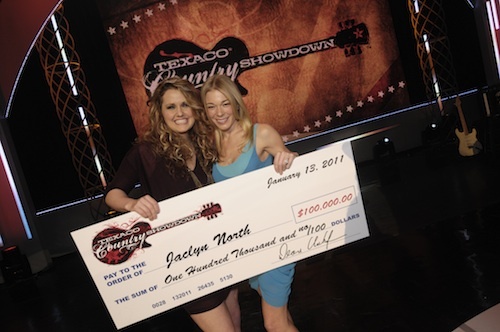 The 2010 Grand Prize winner was Jaclyn North, originally from Garland, TX, and now living here in Nashville. Jaclyn represented the Southeast Region, radio station KHOZ in Harrison, AR, and made it through to the finals by winning her regional at the Arkansas State Fair in Little Rock. She showcased her awesome voice and her songwriting too, performing 2 original songs and putting on a great show for all of us in attendance. The other 4 finalists were Kendall Phillips, who represented the Northeast Region and WFMS in Indianapolis, IN, Reggie Shaw, from the Midwest Region and KRGI in Grand Island, NE, Carin Mari, the Southwest Regional winner, sponsored by KBVC in Salida, CO, and Greg Scudder, representing the West Region and KNTY in Sacramento, CA. All 5 of these singer/songwriters did a great job competing and entertaining the packed house at the Ryman with their respective fan clubs out of their seats and cheering them on. This show was filmed and will start airing at various times in cities across the country in February and March, in addition to being available for purchase on DVD. To find out more about the 2011 Texaco Country Showdown, just visit their web site at www.countryshowdown.com where you can even enter the contest if you think you've got what it takes to be the 2011 winning act. Good luck to one and all and thank you Dean, and your excellent staff at SPI, for continuing to promote this fantastic competition and giving so many musicians a chance to live their dream!